Hello from Nashville, friends! I’m down here for a meeting today because this is a VERY SPECIAL week for our family. Jonathan’s first single is going to be release on FRIDAY!!! This has been a year in the making, and we can’t wait for y’all to hear it. If you want to pre-order it for about a dollar on Spotify or other music apps, click HERE. I’m headed home to Kentucky after the meeting today, and I am excited because we are going to see a little drop in the temperatures this weekend! It is going to feel like fall, and we are going to our first Fall Festival of the year on Saturday. 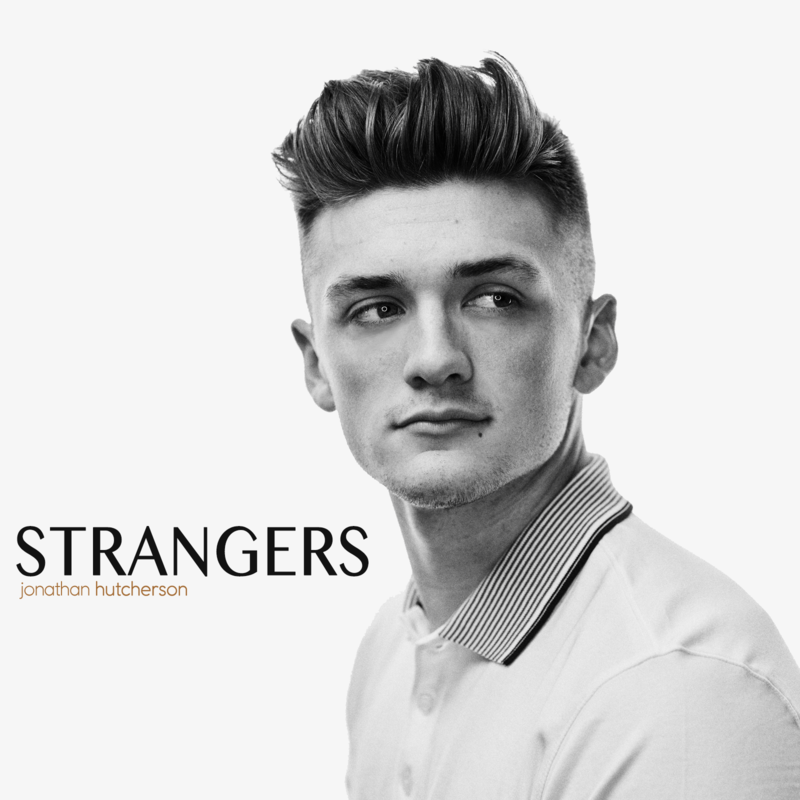 And Jonathan will be coming home on Friday to sing at the Fall Festival on Saturday afternoon, and then perform at Asbury University’s Student center for his “Stranger’s Release Show” that night. It’s going to be a fun weekend! 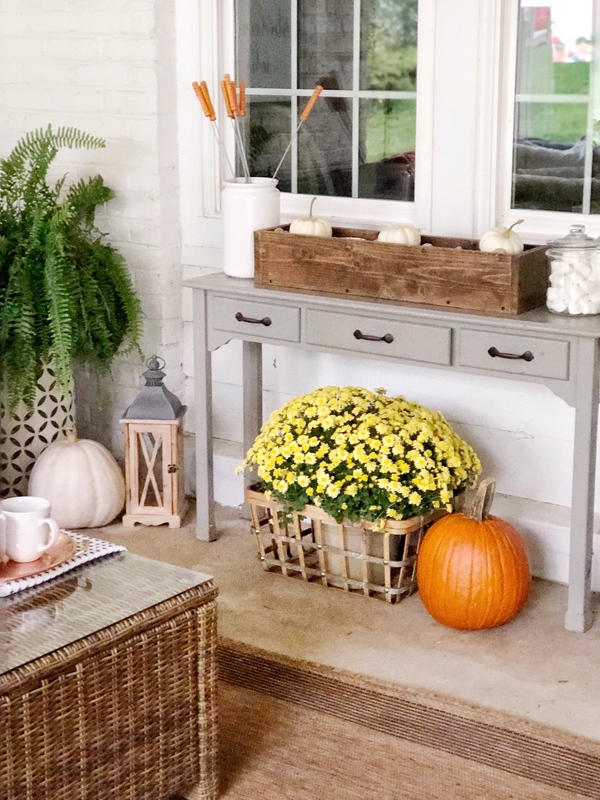 He’s bringing up a few guys in his band, and they will stay at our house, so I am hoping we get to hang out a little on the back patio, now that it is “fall-ified!” Today, I wanted to share my back patio fall decor with you! 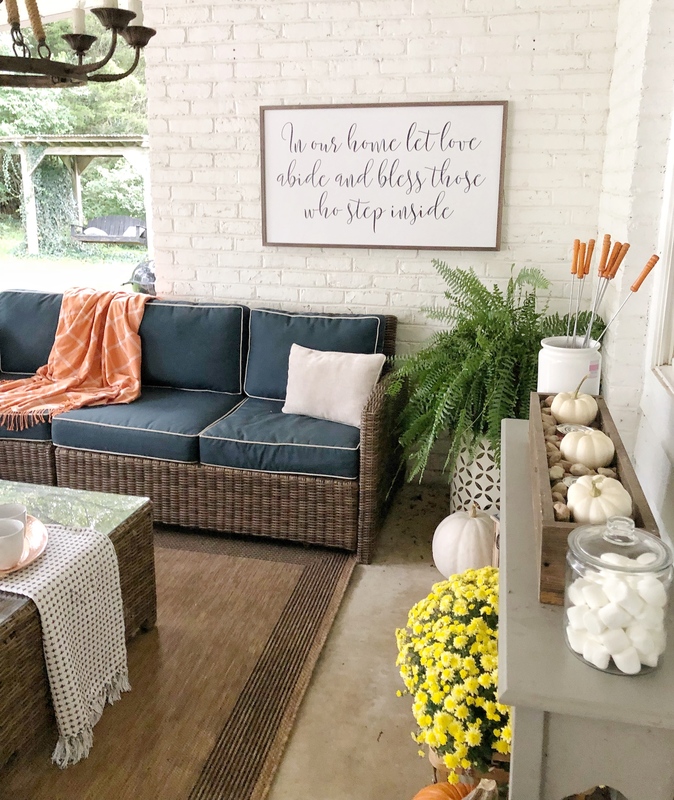 I love having a covered back patio because it keeps my furniture protected from the elements, and I am able to bring some of the indoors outside, like pillows, blankets, lamps, etc. Our back patio furniture used to be in front of those two windows, but our dog kept jumping up on the back of the couch and scratching the windows to get our attention when he wanted to come inside. He tore both the screens on the windows, so I decided to do a little switch-a-roo with the furniture and move the couch away from the window. 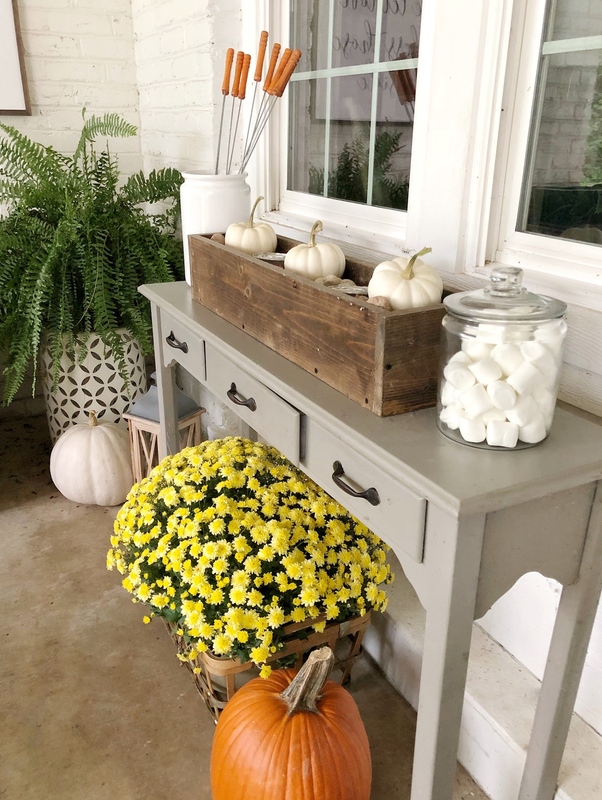 I moved this old gray painted table in front of the windows, and turned it into a little s’mores station. 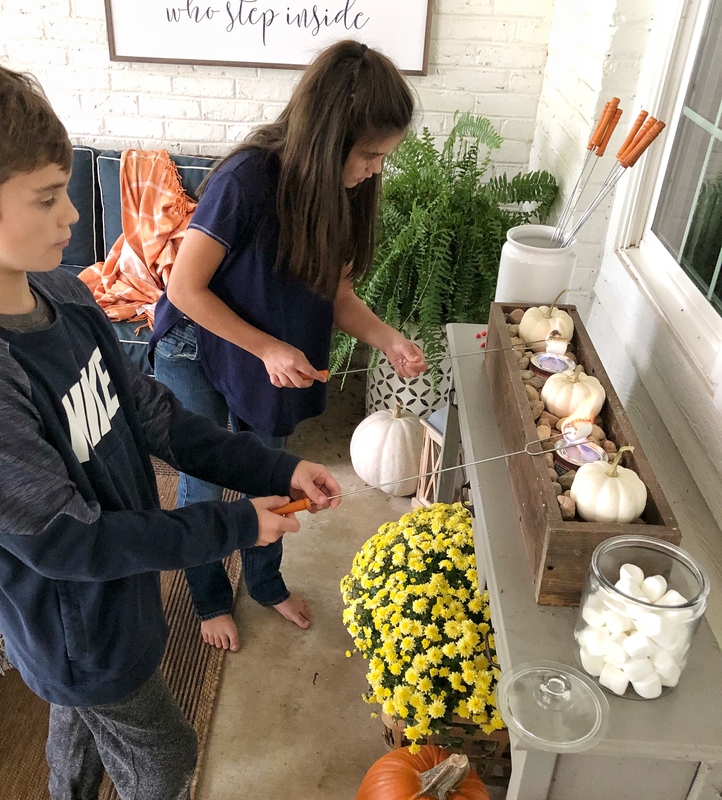 You can’t see it in the picture above, but there are actually two little bio-fuel cans between those three white pumpkins in the wooden box that we light to roast our marshmallows. You can see how I made it HERE. I’m a traditionalist when it comes to holiday colors. 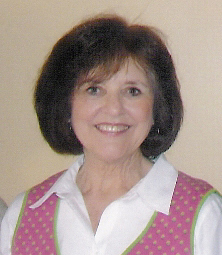 I love bright oranges and yellows for fall, and I love bright reds and greens at Christmastime. 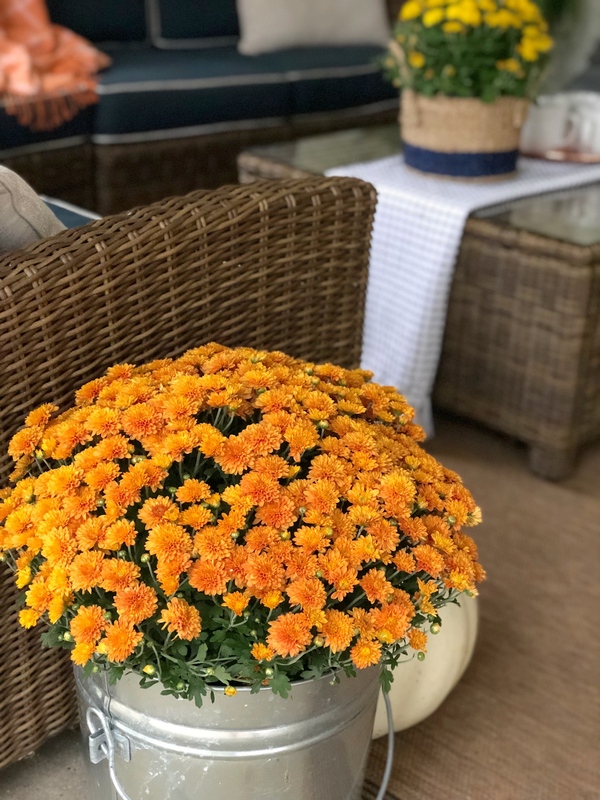 Simple yellow and orange mums, and white and orange pumpkins, are what make up our back patio fall decor. 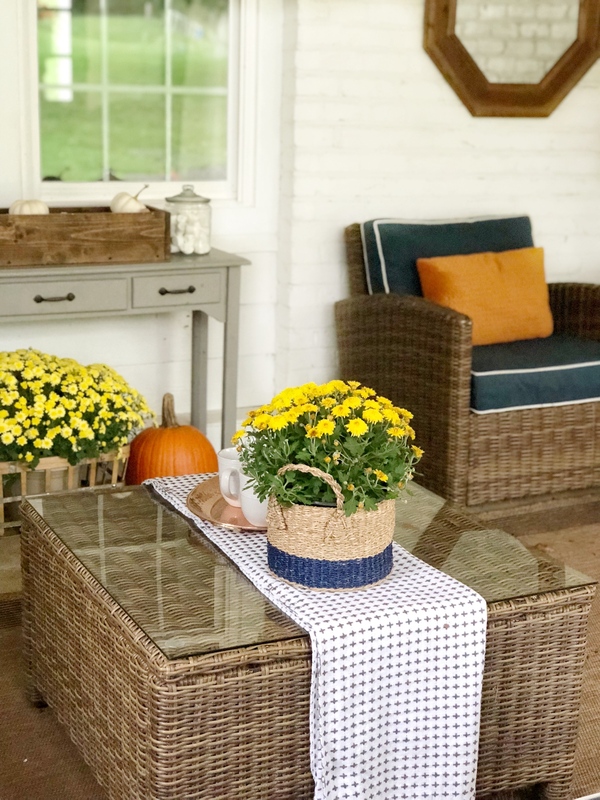 I particularly love the way the orange and yellow look with my navy blue patio furniture. 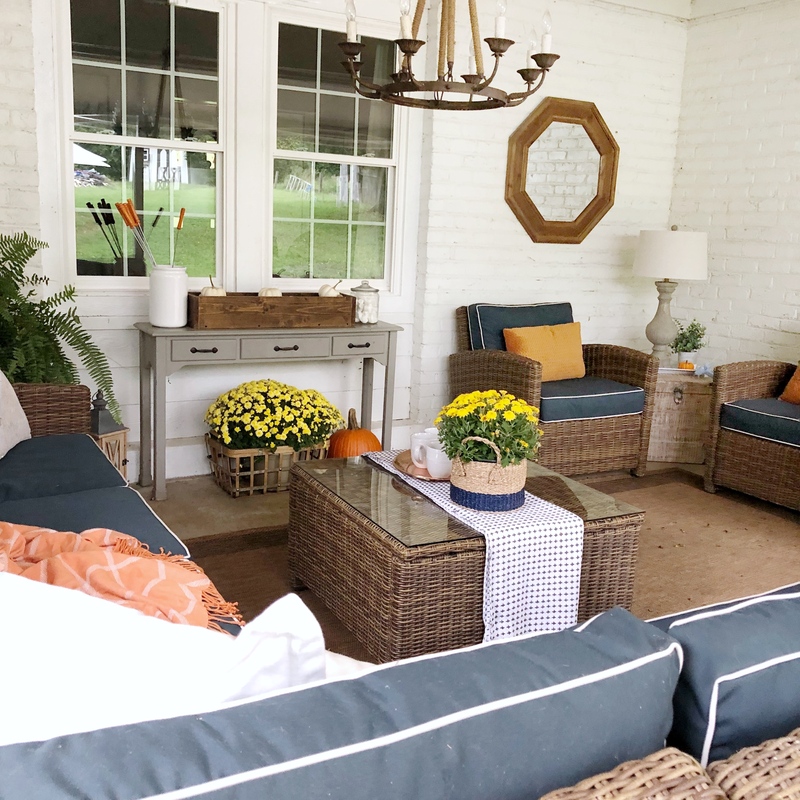 I’m going to be spending a lot of time out here this fall, reading books, sipping hot chocolate or apple cider, and maybe even sneaking in a few naps! haha! It’s definitely a peaceful place and one I like to be in! After I fall-ified our back patio, Sania came out and joined me for some cider. And then she and Eli roasted some marshmallows. 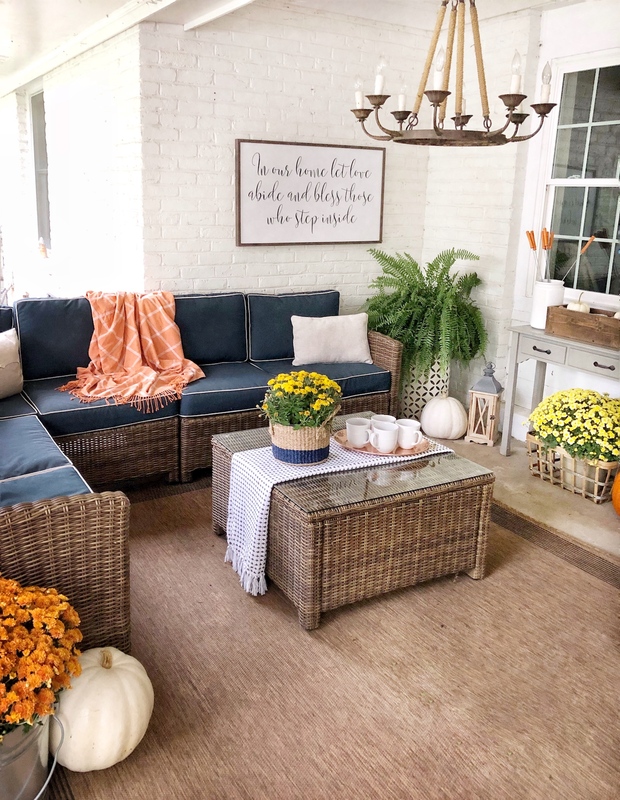 Thank you for letting me share my back patio fall decor with you today! 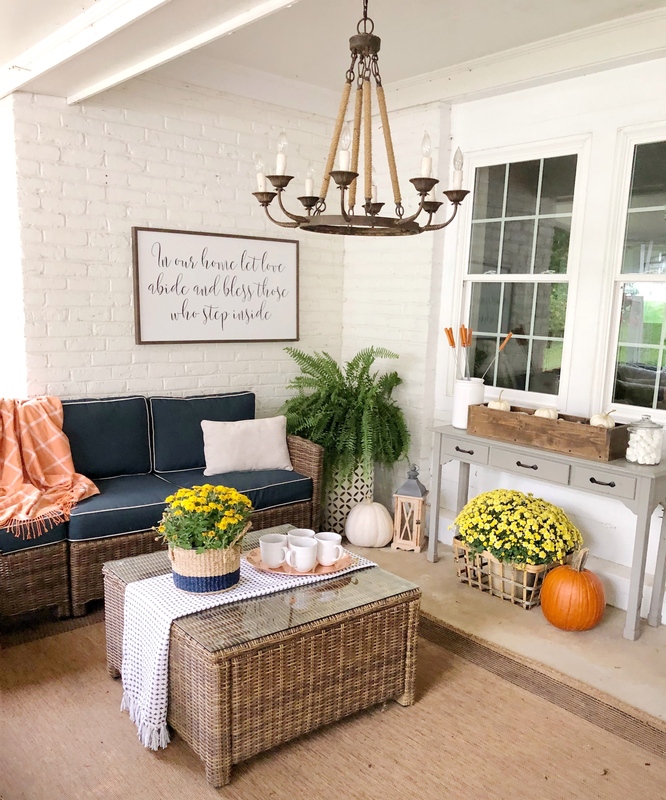 Some of my sweet blog friends are sharing their fall porches and patios today as well as part of the Seasons of Home Tour hosted by Kristen from Ella Claire Inspired. 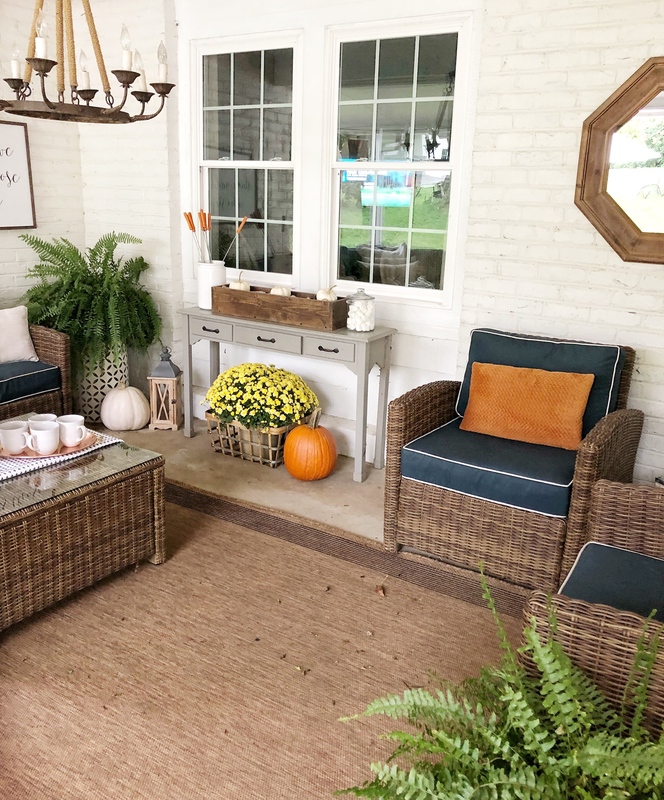 Outdoor spaces are my favorite spaces, so I can’t wait to check them all out! You can too by clicking on the links below! 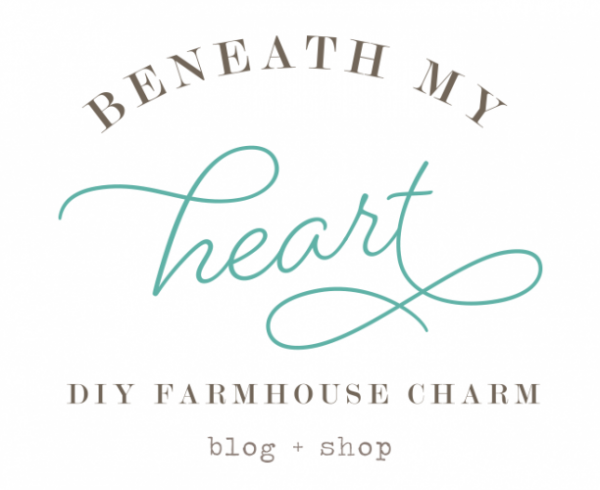 Love your back porch! I’d be out there all the time if it was mine…..so cozy! As Always you inspire me! 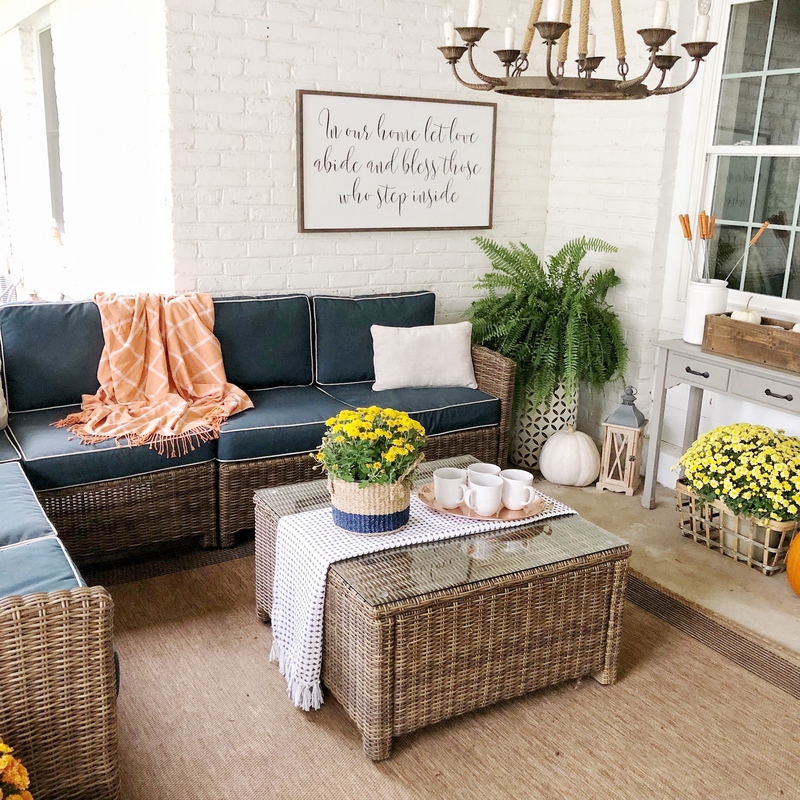 LOVE your Decorating……….the back patio is SO inviting and cozy!! Best of luck and Blessings to Jonathan! I’m so excited to download his new release…….have followed him since “The Voice”!! Just listened to his song. Seems like your baby boy turned in a man overnight! The song is FANTASTIC! I ‘m buying it and posting it to my facebook page and Pinterest. GOOD LUCK JONATHAN! The song is fabulous!! Congrats to all of you! 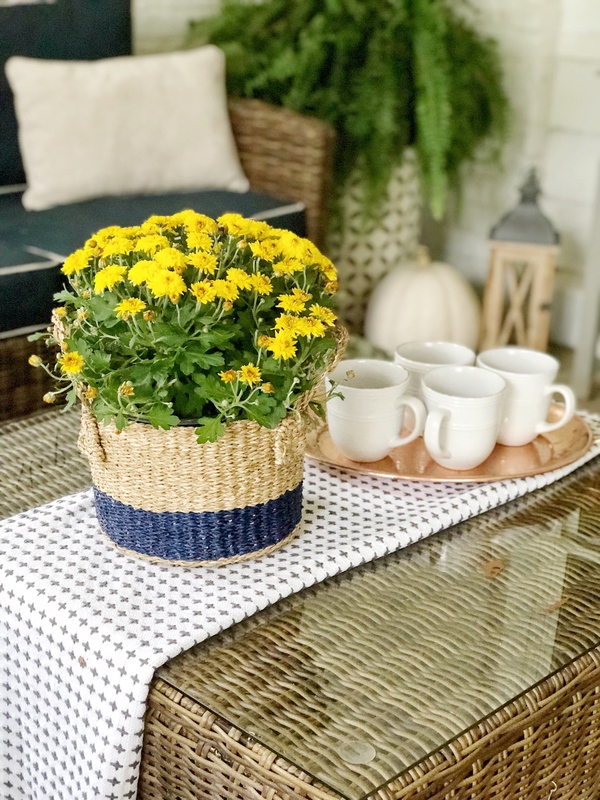 Your patio looks fabulous also! Absolutely LOVE your back patio! I’d be out there every moment I could. CONGRATS to Jonathan (and mama)!!! Just downloaded the song. Hope you all have an ah-making weekend! 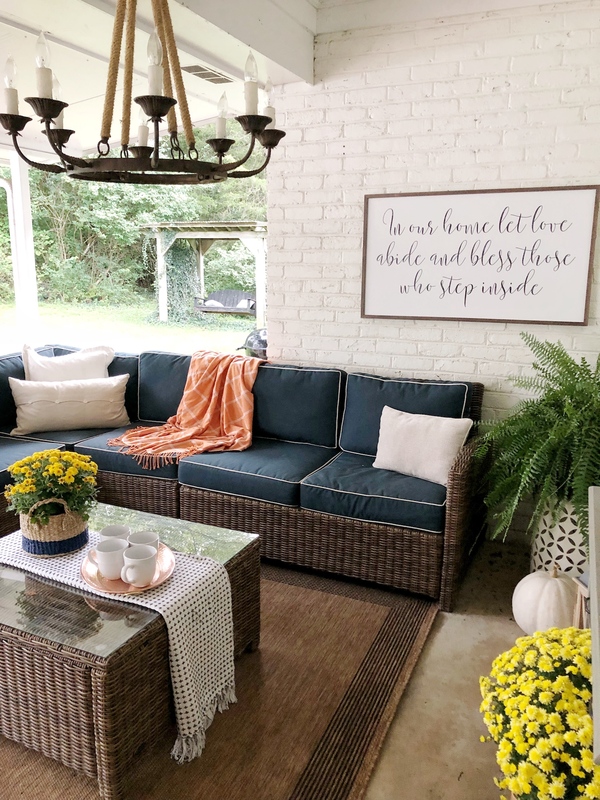 Love your back patio and the song! Both of you are representing Kentucky well! Love Jonathan’s new song! It’s been fun to see how he has grown and blossomed into such an amazing artist! 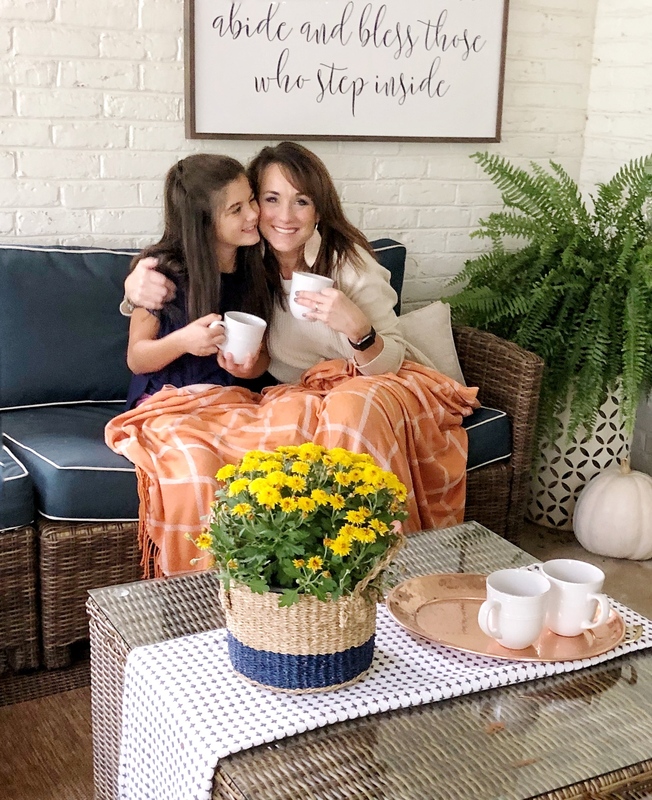 Love your back porch too! 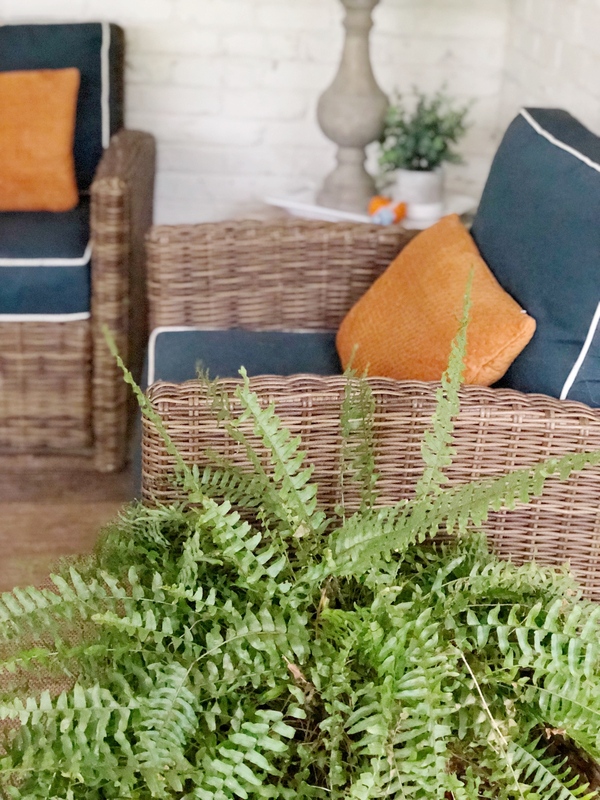 Love your back patio! Bring the traditionalist I am, I love that you use traditional colors. Just beautful and definitely very inviting. So pretty! 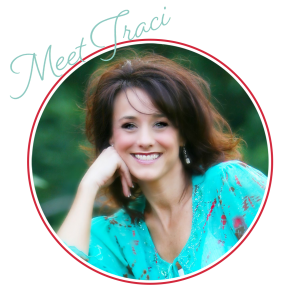 I love everything about this space Traci!